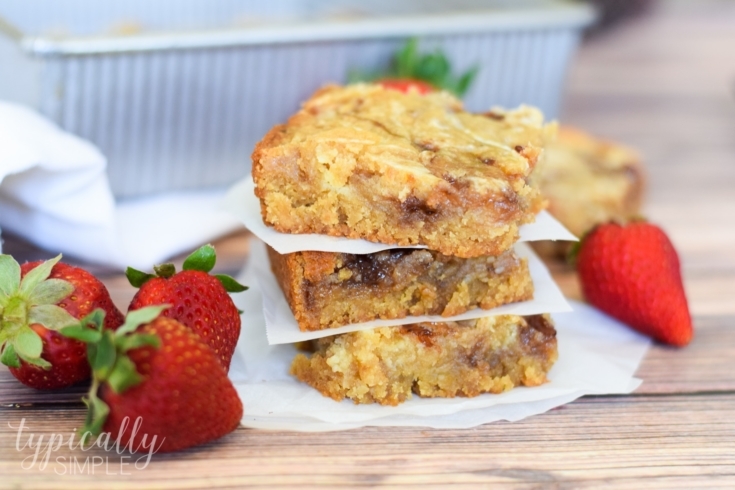 These strawberry swirl cheesecake blondie bars are a decadent treat and quite easy to make. With some basic baking ingredients and a few minutes of prep, this will quickly become your new go-to dessert to make for parties! A few months ago, I shared a post about the yummy red velvet cheesecake brownies that I made from scratch. Most of the time, I am a box mix baker when it comes to making desserts. But I’ve made it my mission to start trying out some baking recipes that are not out of the box. It’s usually the ingredients list that makes me not want to bake from scratch, so when I come across recipes with basic baking ingredients I already have in the pantry, then I feel a little less intimidated. 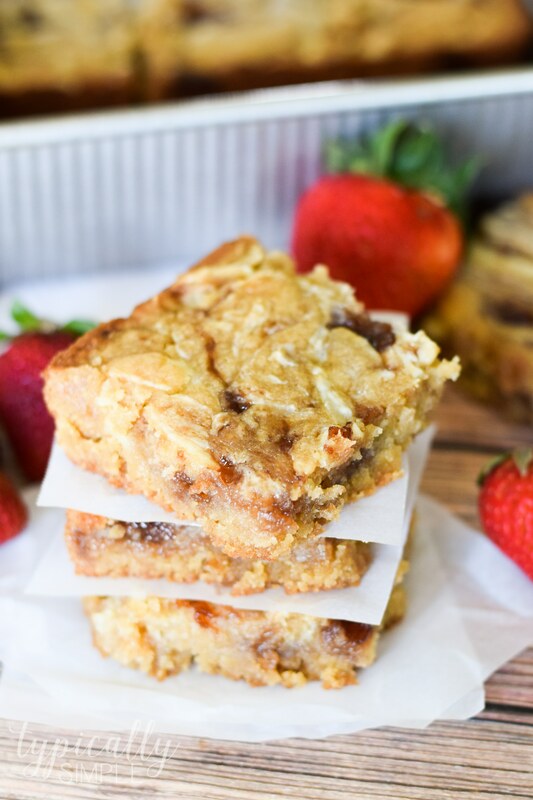 And after tasting these amazing bars, it was definitely worth the time making them from scratch! Preheat the oven to 350. Grease a 9×9 pan. Using a hand mixer, beat the cream cheese and sugar in a small bowl until smooth. Beat in egg and vanilla. Set aside. 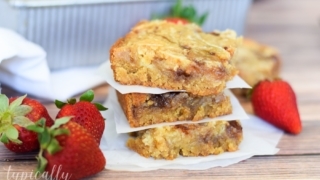 To make the blondies base, melt the butter in the microwave and pour into a mixing bowl. Mix in the sugar, egg, and vanilla. Stir in flour and combine all ingredients well. Heat the strawberry jelly in the microwave for about 10-15 seconds and stir. To assemble the bars, spread about 2/3 of the blondies batter in the pan. Place dollops of the cream cheese mixture over the base and then add spoonfuls of the melted jelly. Spread the rest of the batter on top and run a knife back & forth through all of the layers to swirl the mixture. Bake for about 25 minutes or until an inserted toothpick comes out clean. Allow to cool completely before cutting into bars. 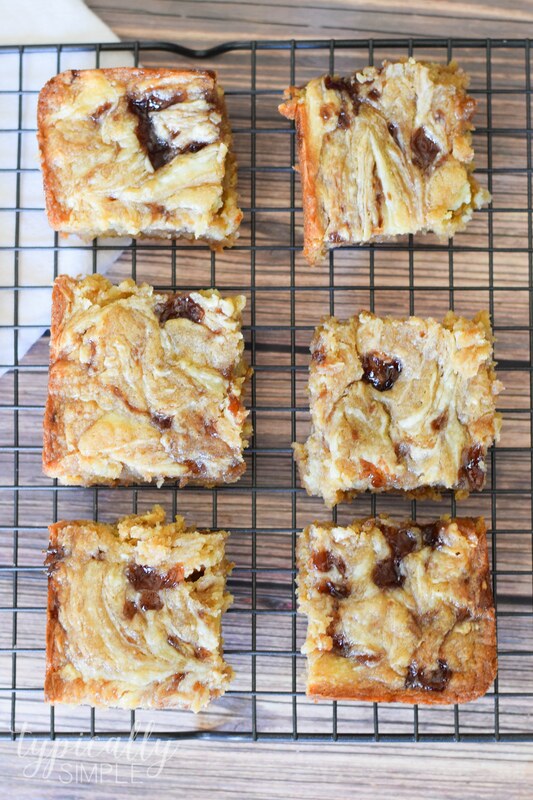 These bars are very rich and decadent with all of the flavors swirled throughout, so I decided to cut mine even a little smaller than squares when it was time to serve them. And because they hold together so well, they are perfect as a bite-sized finger food dessert! Preheat oven to 350. 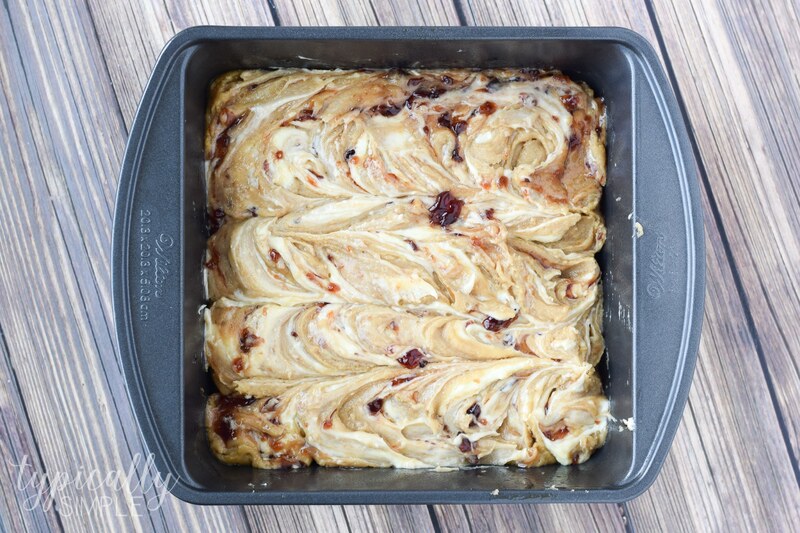 Grease a 9x9 baking pan, set aside. In a bowl, beat cream cheese and sugar until smooth. Beat in egg yolk and vanilla on medium until mixed well. Set aside. Combine melted butter, sugar, egg, and vanilla. Mix well. Stir in flour and mix until all ingredients are combined. Heat the jelly in a microwave safe dish for about 10-15 seconds. Stir. Spread about 2/3 of the blondie batter into the greased pan. Add dollops of the cream cheese mixture on top of the batter. Spoon the strawberry jelly on top of the mixture and batter. Spread the remaining blondie batter over the top of all the layers. Run a knife back and forth through the layers to create the swirl pattern. Bake for about 25 minutes, or until an inserted toothpick comes out clean. Cool completely before cutting into bars. Store in an airtight container in the fridge. Armed with her glue gun and a cup of coffee, you can find Kelly working on craft and DIY projects during nap-time. You might also find her taste testing dessert recipes in the kitchen. Kelly is a former teacher, now stay-at-home mom & a lover of all things chocolate, grande lattes, and the great outdoors...minus the bugs.